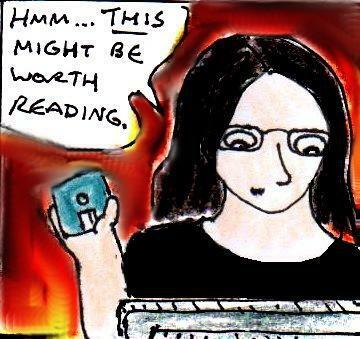 So, you’ve written an e-book or made a comic and you want to self-publish it online. Congratulations 🙂 Naturally, this will include putting a preview of your story or comic on the site you’re publishing it on. Giving people a preview of what you’ve made is pretty much standard practice when you’re publishing online. As well as supposedly mirroring the experience of flicking through real books in a real bookshop, previews also makes the whole experience of buying an e-book a lot more trustworthy by letting your prospective readers know what to expect if they invest in your latest book. But, one of the problems with many e-book sites is that they only allow you to make a certain percentage of your e-book avialable as a preview (the good sites will often let you decide how much) starting from the beginning and going forwards. This sounds good in principle and it’s a good reminder about the importance of writing a strong beginning to your story or comic but, for want of a better word, it seems somewhat limited. After all, when a film studio wants to promote their latest film, they usually compile a trailer showing off some of the best moments of the entire film. They don’t just show the first five minutes of the film. Trailers are great for advertising movies. But, well, e-books aren’t movies. Call me old-fashioned, but I still subconsciously tend to see e-books as being software more than anything else. And, as such, I think that using old-school software promotion tactics could possibly work quite well for e-books. No, I’m not talking about giving out free time-limited and feature-limited versions of your books, I’m talking about giving out good old fashioned shareware. In case you were unlucky enough not to be a computer gamer in the 1990s, “shareware” refers to a way of promoting computer games which was pioneered by Apogee Software and which quickly spread around the gaming industry for a while in the 90s. Basically, quite a few games back then would be divided up into three or four “episodes” and the first episode (the “shareware version” of the game) would be given away for free – with explicit permission for people to share it freely on floppy disks and on the internet. Not only did this give people a large preview of the game, it also meant that the audience would effectively advertise it for free if they liked it by giving the shareware to their friends or posting it online. Plus, since the shareware was only part of a game and it often contained instructions for ordering the full version, if people liked it then there was an incentive for them to buy the full game. Unlike the short promotional “demo versions” of games that were popular in the late 90s and early-mid 00s (which only included 1-3 levels of a game), an old-fashioned shareware version of a game gave the audience a moderately-sized (and often partially self-contained) portion of the game to make them feel really involved in it before asking if they wanted to buy the rest. So, how can this cool sales technique from the 90s be used for e-books? Well, for starters, you will need to create a second (DRM-free) “shareware” e-book as well as your main book which you will give away for free and encourage people to share with each other online. This “shareware” e-book will, of course, include links to where people can buy the full version if they want to. Before you do this, make sure to check that your e-book site both allows you to release things for free and to release multiple things containing the same content. If your e-book site doesn’t allow you to do the second of these two things, then don’t worry – there’s something else you can do in order to stay within the rules (but, more on that later). After this, you need to choose a fairly sizeable part of your book – basically anything up to about a third or so of it. You don’t have to start at the absolute beginning of your story, but your extract should begin fairly close to the beginning – so that you don’t end up confusing your readers. If the extract ends on a cliffhanger of some kind, then this is even better – but it isn’t essential. This will be the “shareware” version of your e-book. Likewise, if your story contains several distinctly different plot threads, then think about compiling one of these plot threads into a single e-book (if this is possible) and releasing this as shareware. If you’re writing a short story collection, then making shareware is really easy. Just compile three or four of your short stories into a separate e-book and release it as shareware. Ideally, you should include one of your best stories (preferably first) and a couple of average stories. Remember, you need to keep some good stuff set aside for your paying customers. But, as I mentioned earlier, some e-book sites might not allow you to publish two books containing the same content. So, what do you do if you are in this situation? Simple, you write something new. It could be a short prequel or a side-story of some kind that introduces one of the main characters. It doesn’t have to be as long as an extract-based shareware e-book (and it could just be a short story), but it should be good enough to make people interested in the world of your story and your characters. Writing a completely new “shareware” story also has the advantage that it’s something extra for people who have already read your full e-book. Yes, this extra short story might not earn you any more money but it will make your existing fans even more loyal and, therefore, more likely to buy your next book. 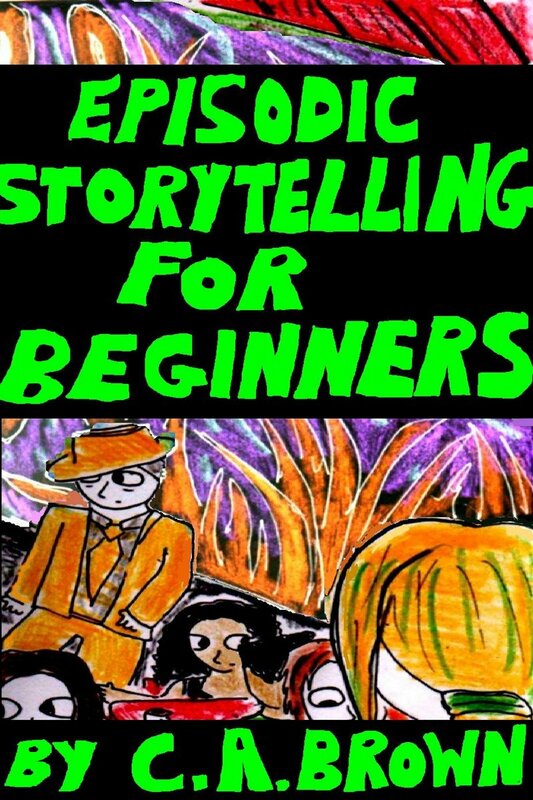 I am very proud to announce that my new E-book “Episodic Storytelling For Beginners” is now available on Smashwords. “Episodic Storytelling For Beginners” is a short guide (made from re-edited articles from this blog) which will give you ten important things to know and/or think about before you start writing your first episodic story. Well, I am very proud to announce that my latest e-book “Your First Webcomic” is available on Smashwords. You can also view a free sample of the first quarter of the book on the Smashwords site too. 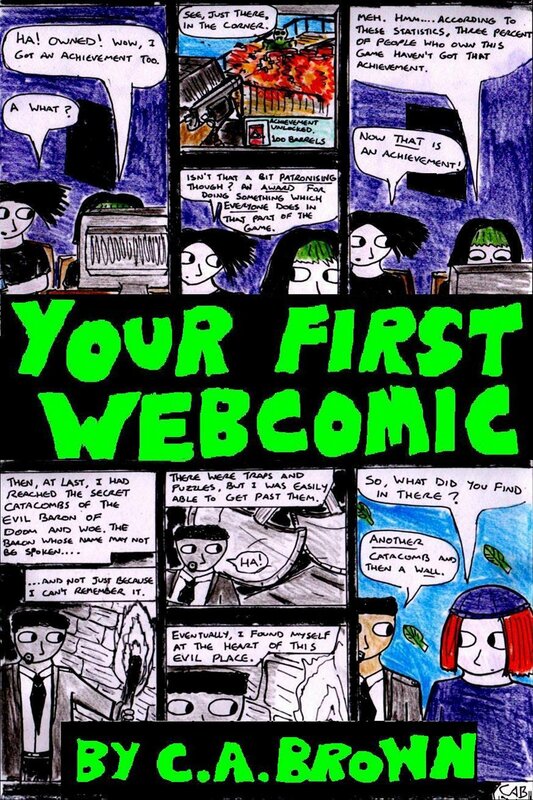 “Your First Webcomic” is a collection of seven re-edited articles from this blog about writing and designing webcomics. Although this guide is text-only (since I’m not sure whether some e-book reading devices can display large images), it will give you a lot of pointers about getting started, quality vs quantity, characters, backgrounds, comedy, B&W vs. Colour art and panel layout. Oh, if anyone is curious, the comic on the cover is one of my webcomics called “Damania“. Although it wasn’t my first webcomic (and I only add to it occasionally these days), it’s probably my favourite one of my webcomics. 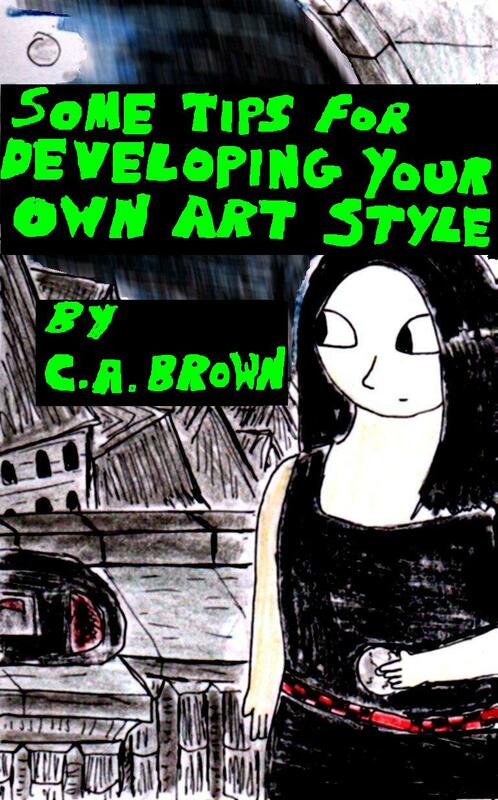 I am very proud to announce that my new (free) E-Book “Some Tips For Developing Your Own Art Style” is now available on Smashwords. “Some Tips For Developing Your Own Art Style” is a slightly revamped version of one of the most popular articles on this blog, which can be found here. Although, unfortunately, it doesn’t contain any images – unlike the original article. You can read the whole thing, without downloading it, by clicking the “view sample” link at the bottom of the Smashwords page. Well, I am extremely proud to announce that my new E-book “Emergency! 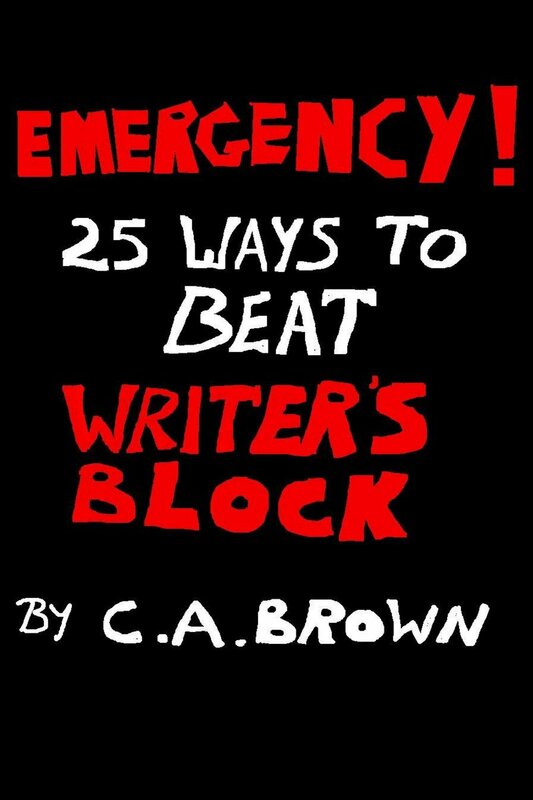 25 Ways To Beat Writer’s Block” is now available on Smashwords. It’s a concise collection of the best twenty-five pieces of advice about writer’s block from this blog in an quick-to-read 5500 word (approx) guide – which is perfect to keep nearby for when writer’s block strikes. It is DRM-free and available in most of the major e-book formats for just $1.99 [approximately £ 1.30 or € 1.52 as of 21st July 2013]. You can read a free preview on the Smashwords site, or check out the links in my “Best of the Blog” articles to find where each piece of advice in the book came from.